Have a few holiday parties to attend this year? Well, have we got a DIY project for you! The holidays are the perfect time to pull out something with a little extra sparkle from your closet, but if your closet is lacking twinkle, we can help. 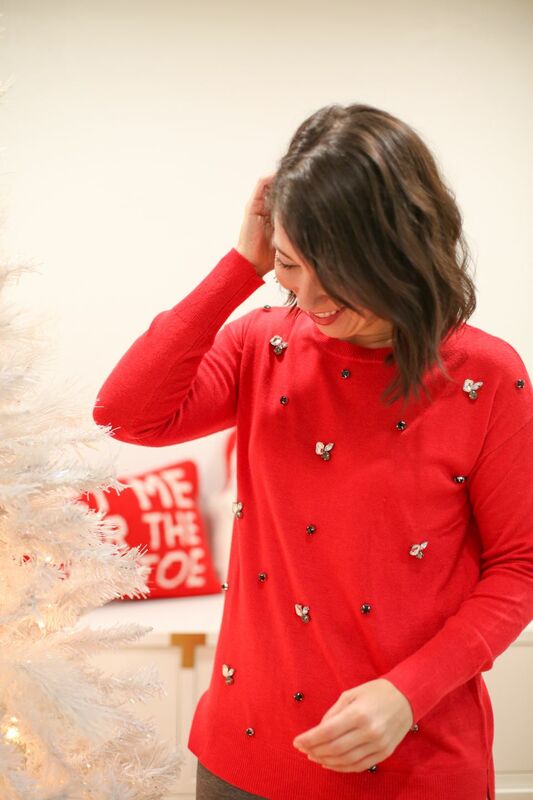 This DIY sweater is also perfect for an "Ugly" Sweater party when you still want to look cute and chic. 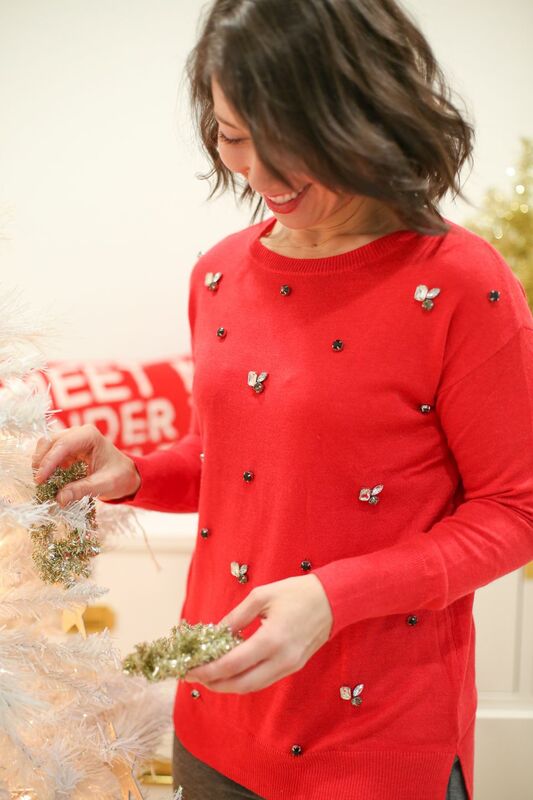 You can make this sparkly holiday sweater in just 10 minutes, with only a few materials. And the best part is that you won't be able to tell the difference between this DIY masterpiece and the pricey version in stores. We can almost guarantee you'll be fielding compliments left and right when you wear this baby out to your next holiday soiree. The most important part of this project is the sweater that you choose as a base. We recommend finding a simple, colorful sweater without a lot of fluff or fuzz in the weave. A simple silhouette will help the rhinestones really sparkle. It's also a good idea to find rhinestones that are set in metal claws. These will give your finished product an elevated look. Insert a piece of scrap cardboard in between the front and back of your sweater to be sure glue doesn't seep through. Add a dollop of glue to the back of each rhinestone and glue it in place. Be careful not to let the glue spread out from under the rhinestones and show. Choose your next stone. We recommend a contrasting shape and/or color. Play with placement until you have an arrangement you like. Glue these rhinestones down as well. Add a third stone to each rhinestone cluster. Another shape in a color that you've already used creates a cohesive look. Glue these rhinestones down in the same manner. Now that your main pattern is completed, use a smaller, contrasting stone to create a sub-pattern. A simple evenly-spread polka dot pattern works well to add some extra sparkle and tie everything together. Glue these rhinestones down once you're happy with their placement. Allow all the rhinestones to dry overnight and thoroughly cure. Then don your sparkly sweater and hit up a holiday party or two!